I’m so happy to see some fresh asparagus at the grocery store again! So delicious, cost nutritious and easy to make, mycoplasmosis it’ll be making its way into my meals so frequently that I’ll probably be sick of it in a month. I’m also excited that Top Chef is back. Drunk chefs and drama make for excellent television. Anyway, the contestant from New Zealand made a quinoa croquette a couple of weeks ago, and I’ve been itching to copy him ever since. Since I’m averse to frying in the house (too messy! ), I decided on a baked quinoa “cake” instead. I really liked the result. It was almost polenta-like, but nutty instead of, um, corn-y. I added some grated Manchego cheese on top and it came out of the oven nice and crisp. In the meantime, I roasted some asparagus and turkey bacon and made a maple, shoyu and Sriracha sauce for that sweet, salty, spicy combination that paired really well with the smoky bacon. I loved the quinoa cake, and can’t wait to try different flavors. This one was mostly cheese and chili powder, but I want to try out different flavors like lemon zest, fresh basil and mozzerella, sun-dried tomatoes and Parmesan, etc. And I’m saving the leftovers for a poached eggs weekend breakfast. Can’t wait! For a vegetarian option, replace the bacon bits with a fried egg or some sauteed firm tofu. Preheat the oven to 375°. Mix the eggs, milk, chili powder and salt together in a large bowl, then add the quinoa and stir until everything is evenly distributed. Pour into a greased 9″ x 13″ baking pan, top with the grated cheese and bake for 20 – 25 minutes, or until the inside is set and the top layer is crisp. If you have 2 ovens, you can start roasting the asparagus. If you don’t, wait until the quinoa is done, then remove it and turn the temperature up to broil. Prepare the asparagus by snapping off the tough bottom parts and drizzling with olive oil, salt and pepper. Spread the bacon out on a greased cookie sheet a place under the broiler for about 5 minutes, or until it’s half done. Add the asparagus over the bacon at this point and broil for 5 more minutes. The bacon and asparagus should be brown and crisp at this point. Leave them under the broiler a bit longer if they’re not. You can also cook the bacon and asparagus in a large skillet if your oven is otherwise occupied. You just won’t get that nice browning effect on the asparagus. While the asparagus is roasting, make the sauce by whisking the ingredients together. 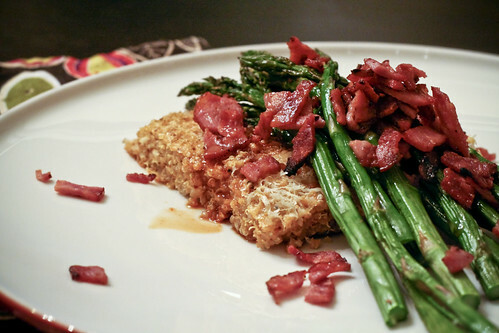 To serve, cut the quinoa into 3″ x 3″ squares, top with a heap of asparagus, a good amount of bacon bits and a few drizzles of the sauce. WOW – this looks amazing – like a perfect meal! Quinoa? Love. Manchego? Love. Chili sauce? Love. Turkey bacon? LOVE. I may have to try this tonight for dinner. Thanks for a fabulous idea/recipe! I really like this use of quinoa, it is something I will have to think about the next time I cook some up. I am sure you could go a lot of ways with this…even a apple cinnamony one for breakfast…and mmm other things too. Yum! I love the idea of the cake, I’ve never tried that before. I also love the topping, asparagus and bacon – classic! What a great way to use quinoa. I have just recently used this in soups but this way it can play a much larger role in the meal! Thanks for the comments! I put a couple of leftover pieces in the toasted on Sunday morning and they came out nice and crisp. They didn’t fall apart at all, even though I was really expecting them to! I topped each piece with a fried egg and some green jalapeÃ±o salsa for a powerful, protein-full breakfast. Gretchen – the apple cinnamon version sounds awesome! I can’t wait to keep experimenting!